I never fancied myself a virtuoso at the violin. I would cringe if anyone called me a “violinist.” I even thought “fiddler” might have been a bit too formal a description. What I did to the violin with my bow could best be likened to the term “player.” In the “fiddling around” sense if you don’t mind the pun. Don’t get me wrong. I enjoyed playing. Ever since third grade. I had a very modest goal: play well enough for me. Just me. Not the audience. That’s why I enjoyed playing. I set the bar low. The notes might not have been precise, but they were close enough for me to pleasantly imagine I was playing the correct notes. That’s all that mattered. Nothing else. When teachers tried to force my square peg into that round Suzuki hole, it stopped being fun. Fortunately, my teachers understood this. Back I went to playing such “A Tune a Day” classics as “Arkansas Traveler,” “Santa Lucia,” and various Christmas Carols. I played those tunes over and over, (although not “a tune a day” as my teacher would have preferred). While my pitches weren’t quite perfect, I did get the basic idea. And I was back to having fun fiddling around again. And so, for several years, I played, mostly for myself. And my teachers let me. Secret within this pleasure lay the mathematics of audio. Unlike other instruments, string instruments lay bare the physics of sound. Where you place your finger determines the “length” of the string. The length of the string, in turn, determines the frequency at which the string vibrates. That frequency, finally, creates a specific sound, or musical note. Think about it. A song becomes a series of syncopated finger positions, tapping away on various strings on the neck of the violin. It’s not unlike tapping your fingers on a typewriter to produce a series of words that become a story, that become a column, that become a memory forever etched in print. If you think about it, this “violin math” represents nothing more than a simple machine. I became that machine every time I sat down to play. Here’s something that I realize now. It explains why I, a plebian player, so relished playing the violin. When I played, when I became that machine, I got lost. The machine absorbed my soul. It was a freeing. All else around me disappeared. I was one with the music, or at least what was music enough for me. Ironically, this gave me a certain confidence in my playing. This confidence might perplex those more attune to the finer elements of string instruments. I had no pedigree. I had no Hochstein school credibility. Like I said earlier, even calling me a “fiddler” was a stretch. In the performing arts, confidence can go a long way. It can even trump perfection. Think about it. How often are we captivated by a speaker who exudes a dynamic physical confidence while we ignore the lack of facts within the content of the actual speech. That’s human nature. Above all else, successful performance must first appeal to human nature. Cynics – and aficionados – might find this insight into the psychology of the masses repugnant. Nonetheless, it remains the hand with which we have been dealt. Marketers understand and accept this reality. And so do successful artists. Don’t confuse this with the “sincerity vs. technique” dichotomy. There, you’re to make a choice between someone who really cares versus someone who’s merely technically proficient. Most people instinctively pick the sincere person, until the choice is for the surgeon who’s about to operate on them. In arenas where proficiency is a matter of life and death, we’ll opt for technique over sincerity every time. The stage, the art gallery, the concert hall, rarely present life and death situations. Artists, unlike doctors, scientists, and engineers, use a different metric when determining the path to success. Fundamentally, music teachers, as artists, share this understanding. Ideally, a performer must both look the part as well as act the part. If, however, the situation requires you to choose only one, it’s better the performer look the part. The audience prioritizes the visuals above all else. That’s why TV viewers thought Kennedy beat Nixon in their debate while radio listeners clearly saw Nixon as the winner. 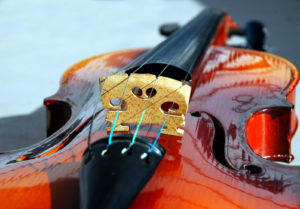 At the beginning of sophomore year in high school, (the previous concertmaster having just graduated), the teacher needed to pick a new person. She had to make a choice between me and a better violinist. I didn’t even know what a concertmaster was, let alone that I was in the running for it. So, when the teacher placed me in the much valued seat, I paid it no mind. I played just as I always had – for myself, but with enthusiasm. In the end, it was that enthusiasm that sealed the deal. Of course, this decision didn’t sit well with the better violinist. And she took the teacher to task for it. I came along for the ride, collateral damage in a war I didn’t realize I was in. What followed was a pregnant pause. Then our teacher provided an answer not merely to this single question, but to many questions life would inevitably present.